The CNA Salary in Washington depends on the area you work and the level of your experience in the field. CNAs who work in Washington State are under the supervision of the Washington State Department of Health. This department is responsible for registering and monitoring the CNAs in the state. Certified nursing assistants must apply for and be licensed by the Washington State Department of Health before they can be hired by a healthcare facility. According to Glassdoor.com, the national average salary that a CNA can expect in the United States is $26, 410. CNAs in Washington State actually get a little better than the national average. CNAs in Washington State can expect an average base pay of about $25,419 a year. According to Nursegroups.com, CNAs in Washington State are some of the highest paid in the country. They place the average annual salary of a CAN in Washington State at $22,000 a year at the lowest and $31,000 a year in the highest. The salary of a CNA in Washington State usually varies depending on the city or town that the CNA was hired in. Working in a large city will pay more than working in a small town or rural areas in Washington State. Check out the list below from Salary.com to find out the annual base pay of a CNA in popular cities for Washington State. The amount of experience that a CNA working in Washington State has will also affect their pay grade. Entry-level CNAs will not be offered salaries in a higher price range. This is because most employers will see you as being “still in training” and they prefer CNAs with a proven work history and experience. In Washington State, nursing homes are the most willing to hire new or inexperienced CNAs. According to Healthgrad.com, a CNA in a nursing home, can earn an average salary of $62,000 a year. Other job position to look for is Hospital Nursing Assistant ($65,000), Home Care Assistant ($62,000), and Health Services Assistant ($42,000). If you rack up enough experience, you might eventually look into becoming self-employed. According to Paysa.com, the average salary of as self-employed CNA in the United States is $45,926. This can vary according to your location. For example, in Seattle which has one of the highest average annual salary rates for CNA’s, a self-employed CNA is paid an average of $51,980 a year. Thinking of getting into the medical field? Becoming a certified nursing assistant is a great first step. 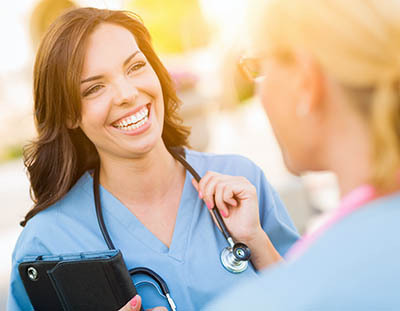 A certified nursing assistant, also known as a nursing assistant or state-tested nurse aid, is someone who takes care of patients in a clinic or hospital setting. CNAs can also be found in senior care facilities. They provide care for sick or incapacitated persons while under the supervision of a registered nurse. If you are interested in helping people or ease the discomfort of the sick, elderly or handicapped, then becoming a CNA is the job for you. To learn more visit this page to find CNA classes in Washington that will help you achieve certification to work.